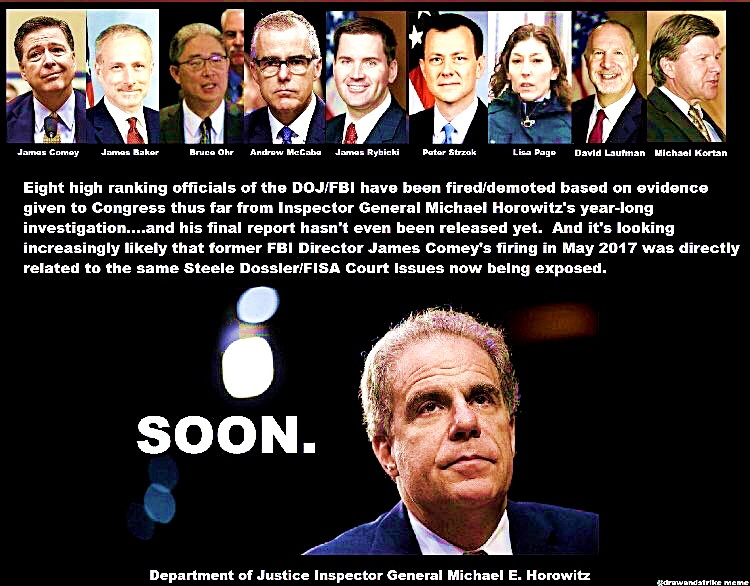 FBI And DOJ Corruption! How Is It That Barack Obama Has Not Been Questioned? 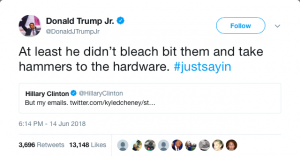 When Will Someone Go To Jail? Five FBI officials, including Peter Strzok and Lisa Page, have been referred to the bureau for possible disciplinary action over anti-Trump text messages. In addition to Strzok and Page, the three other officials referred for disciplinary action are two FBI agents and an attorney who worked on the special counsel’s Russia investigation. The investigation will focus on whether the employees violated the FBI’s Offense Codes and Penalty Guidelines. 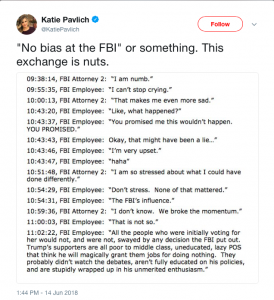 “The conduct of the five FBI employees … has brought discredit to themselves, sowed doubt about the FBI’s handling of the Midyear investigation, and impacted the reputation of the FBI,” reads the report. “In its review of collected materials, the OIG found that several FBI employees had exchanged text messages, instant messages, or both, that included political statements hostile to or favoring particular candidates, and appeared to mix political opinion with discussions” about the Hillary Clinton email probe. Anti-Trump exchanges between Strzok and Page have been well documented. The pair, who were having an extramarital affair, frequently criticized Trump while they were both working on the FBI’s Russia investigation. “F Trump,” Page, an FBI attorney, wrote in one message to Strzok, the bureau’s deputy chief of counterintelligence. Strzok was removed from the special counsel’s investigation last July after the OIG discovered the messages. Thursday’s report reveals for the first time that three other FBI officials exchanged anti-Trump and pro-Clinton messages. One FBI lawyer who worked on the Clinton investigation and served as the bureau’s top attorney on the Russia probe said he felt “numb” by Trump’s November 2016 election win. And on Nov. 22, 2016, he wrote “Viva le Resistance” when asked about Trump. The lawyer, who has not been identified, joined Special Counsel Robert Mueller’s team last May but left in late February 2018 after the OIG revealed the private messages. The OIG report also flags messages exchanged between two agents referred to as “Agent 1” and “Agent 5.” Both worked on the Clinton investigation but not on the Trump-Russia probe. 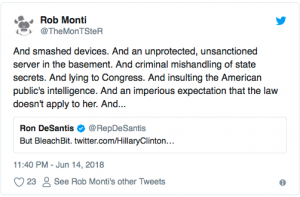 Agent 1 was one of the agents who, along with Strzok, interviewed Hillary Clinton in July 2016. “I’m done interviewing the President,” the agent wrote, referring jokingly to then-candidate Clinton. The agents also suggested in text messages on Election Day that there would be riots if Trump defeated Clinton. “You think HRC is gonna win right? You think we should get nails and some boards in case she doesnt,” Agent 1 wrote. “She better win… otherwise i’m gonna be walking around with both of my guns,” Agent 5 responded. Though the OIG, led by Michael Horowitz, blasted the FBI officials over the messages, the agency said it “found no evidence to connect the political views expressed by these employees with the specific investigative decisions” in the Clinton email probe. The report did not assess whether Strzok, Page or the other agents displayed bias that affected their work on the Trump-Russia investigation. 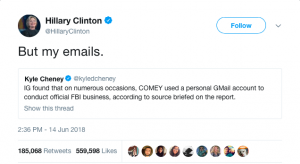 Hillary Clinton threw an absolute fit when it was revealed in the IG report that James Comey had himself had a private email with which he had conducted some business. It got over a half a million likes and was cheered by many on the left. 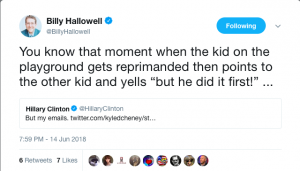 Despite the fact that it basically amounts to a “he did it too!” which doesn’t excuse her. 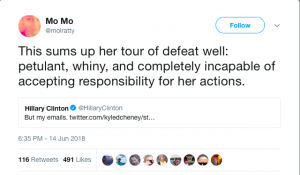 Not to mention what she did was far worse because she created a private server specifically to avoid government oversight of her emails, she sent and received classified emails, she exposed the server to attack and it was in fact breached with secret info taken by foreign actors, and she wiped the server and her assistants destroyed their phones. But most were not taken in by her nonsense.